Reimagining the design language and surfaces. The clearly sculpted shark nose at the front end spawns dramatic surface contouring that extends the full length of the flanks. 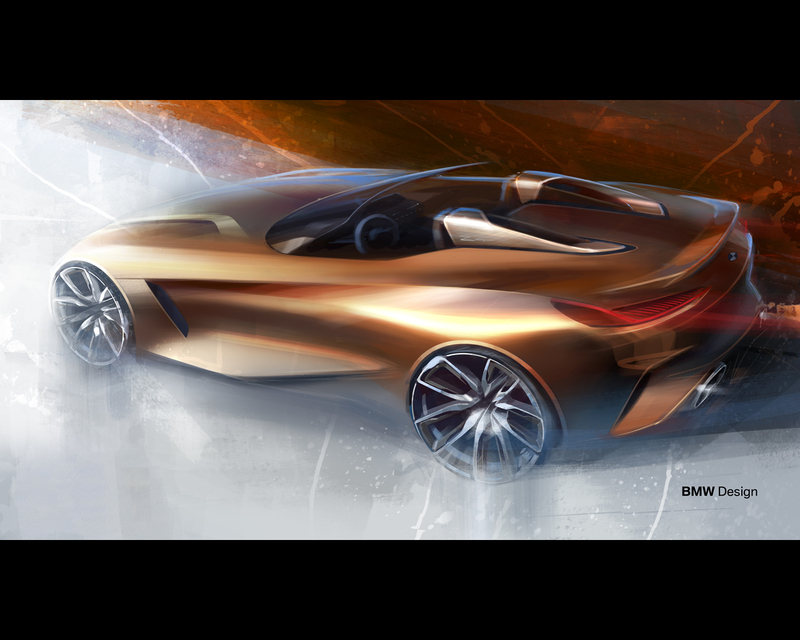 The new direction taken by BMW’s design language can be seen here in just a few precise lines that form clear surfaces, while the body’s volumes are powerfully sculpted. The surfaces and forms therefore create an extremely modern and emotionally engaging impression. The large Air Breathers rearwards of the front wheels act as the source of the flanks’ elaborately modelled surfaces (they appear to be shaped by the flow of air as it exits the Air Breathers). Light and shaded surfaces develop in a rising movement towards the rear, then twist to form muscular wheel arches and athletic volumes. All of which shines a bright stylistic spotlight on the car’s rear-wheel drive. The dramatic interplay of lines and surfaces underscores the wedge shape of the flanks and infuses them with even greater dynamism. And the low door sills, with their distinctive crease, makes the body appear closer to the road, emphasising the low-slung sensation when viewing the car from the side. Low and progressive – the front end. 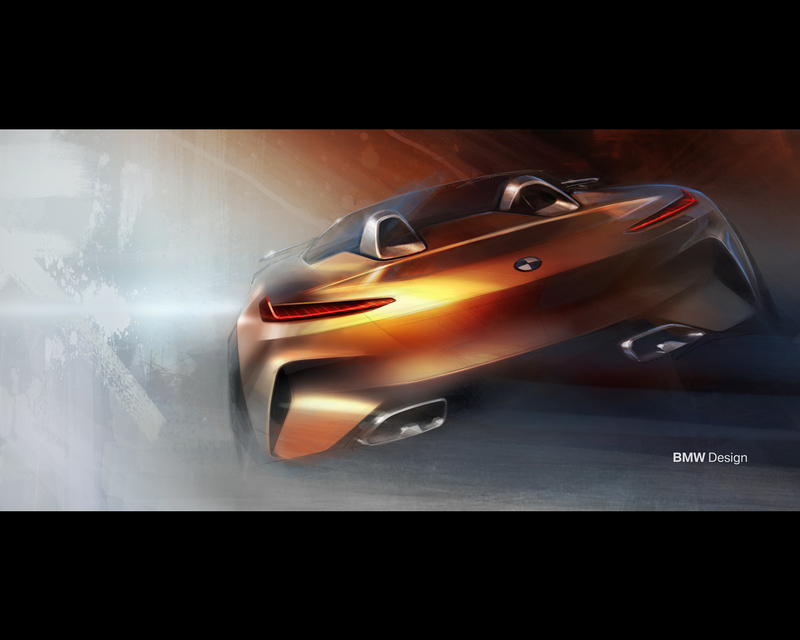 The design of the BMW Concept Z4’s front end is undeniably sporty in nature. 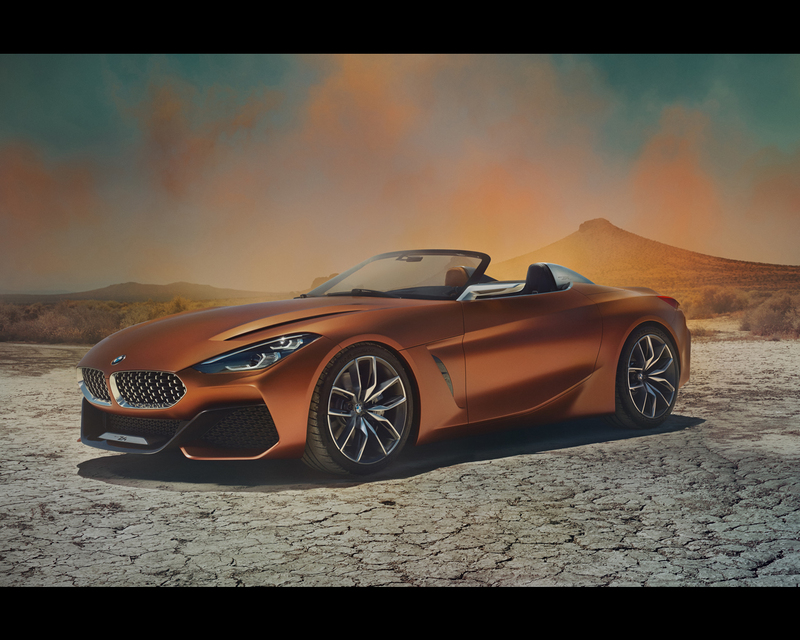 The relationship between the low-set, broad kidney grille and the positioning of the headlights higher up sparks deliberate associations with the BMW Z8 and lends the BMW Concept Z4 a certain flamboyance. In place of the customary bars, the inside of the kidney grille features elaborately designed mesh, whose vertical orientation recalls the sporty, functional kidney design of early BMW roadsters such as the BMW 328 Mille Miglia. 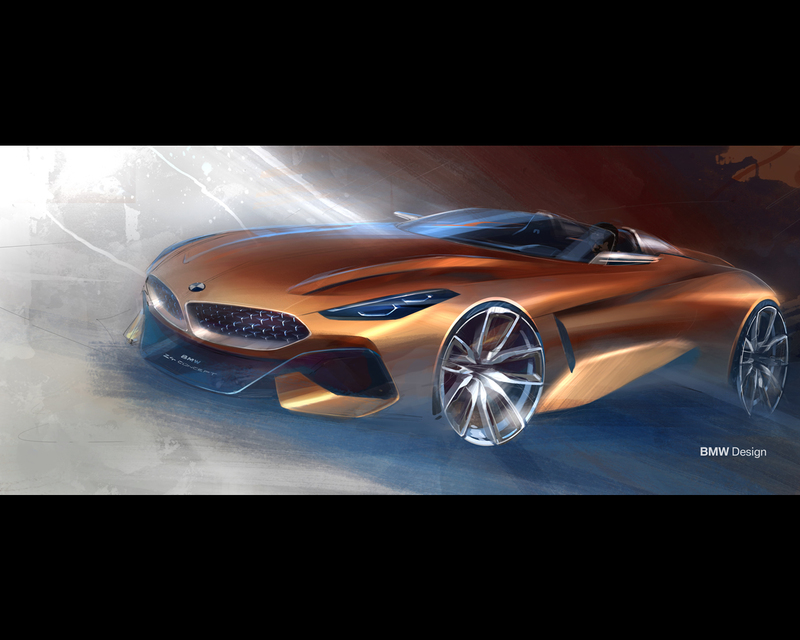 In a departure from the BMW norm, the Concept Z4 provides a vertical interpretation of the classical four-eyed headlight look, with two overlapping tubes on each side. The turn signal indicators point diagonally towards the kidneys from above and underline the dynamic flair of the front end. And the clamshell bonnet with stylised gill vents curves over the wheels, creating an intriguing and virtually seamless sweep over the front end as a whole. The front apron cuts a genuinely athletic figure with its sculptural design language. Its trio of large air intakes are a nod to the powerful engine further back and so carry the promise of a dynamic driving experience. The large carbon-fibre insert in the central air intake is straight out of the motor sport playbook and champions the use of detail to emphasise the front end’s dynamic presence. 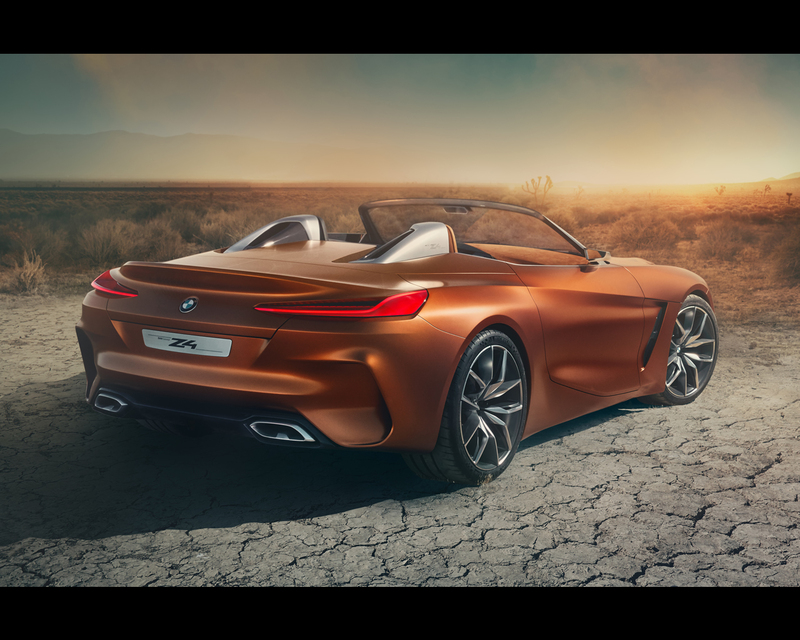 Together, these design elements compose a fresh and memorable face for the Concept Z4 – one which pays a very modern and sporting tribute to the celebrated roadsters of BMW’s past. Athletic and eye-catching – the rear end. 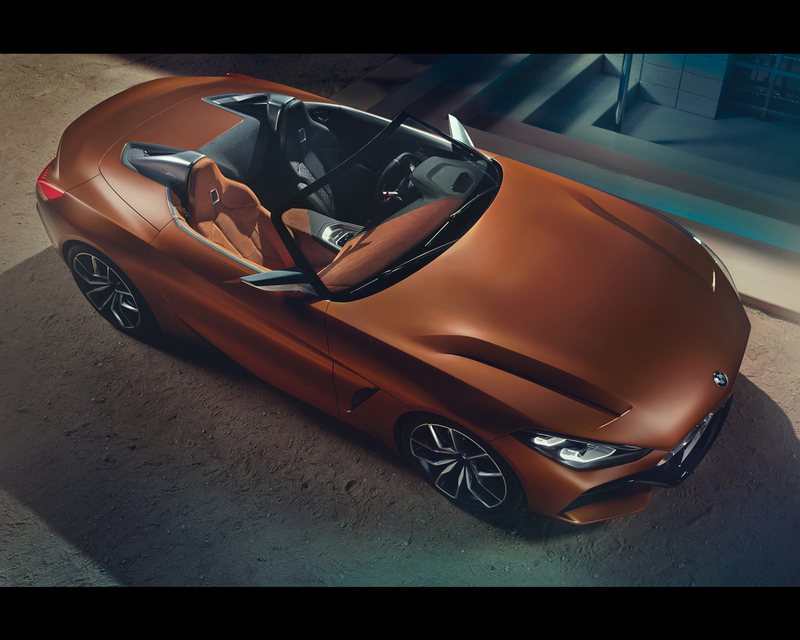 The design of the BMW Concept Z4 likewise references details and qualities from BMW’s rich roadster tradition and updates them for the years ahead. The wide and low design of the rear picks up the lines of the car’s flanks and massages them into a modern rear of beguiling clarity in terms of surfaces and styling elements. The powerfully flared wheel arches give the car broad haunches, which are emphasised by the slim, L-shaped rear lights and therefore further enhance the car’s sporting stance. Above the rear lights, the boot lid – complete with prominent spoiler – stretches across to the burly wheel arch extensions, sending out a message of power-infused agility. Below, large air outlets in the rear apron create their own dynamic impression. The carbon-fibre diffuser adds a sporty and exclusive flourish and signs off the rear end at its lowest point to the road. Exterior and interior in unison. 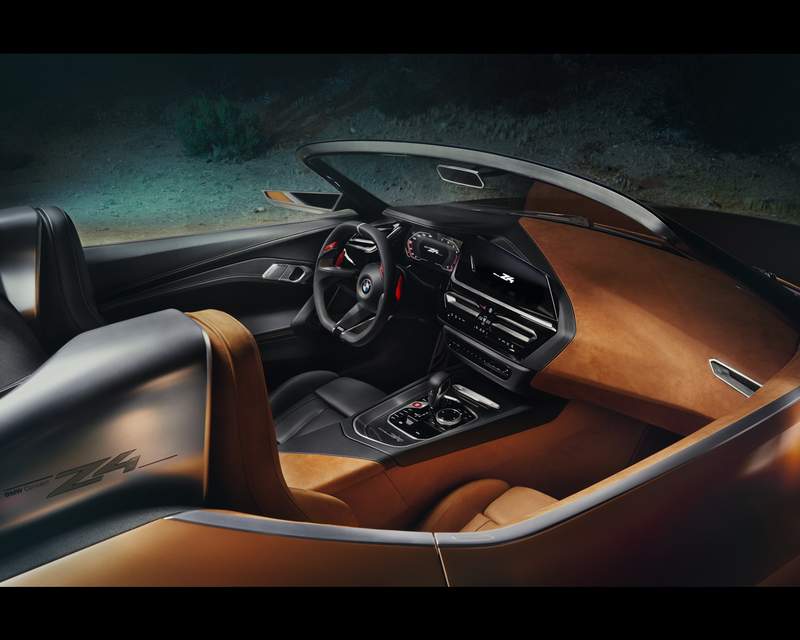 The kinship between the interior and exterior of the BMW Concept Z4 is evident in both forms and colour scheme. The design language of the interior takes the powerful, three-dimensional character of the exterior and adds another voice to the dynamic chorus. 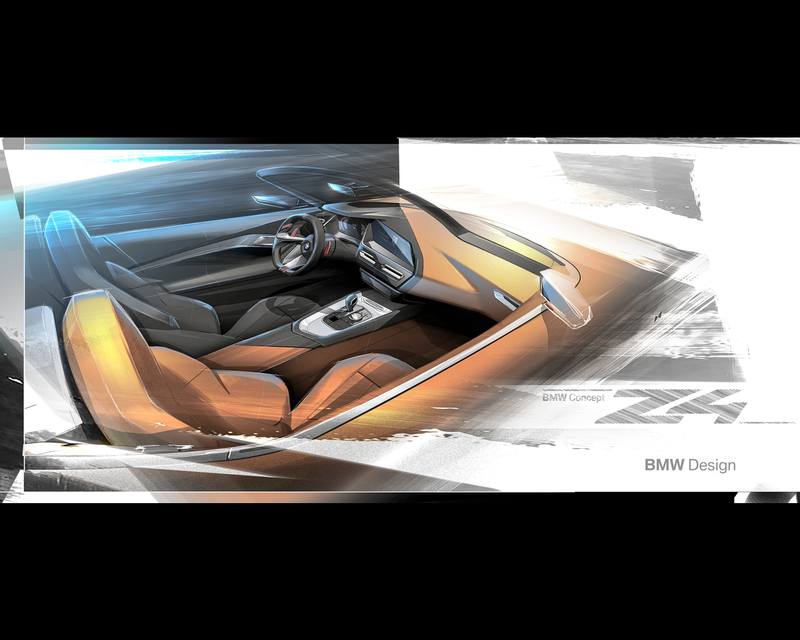 Much of the interior adopts the colour of the car body, creating a clear visual link between the interior and exterior. Only a classy chrome trim strip provides separation. Maximum focus on the driving experience. 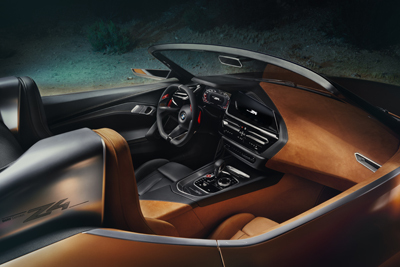 At the same time, the interior serves to reinforce the total focus on the driving experience too. The driver’s seat as well as the door trim panels, instrument panel and centre stack that encircle the driver are finished entirely in black, meaning that they stand out prominently from the coordinated orange shades of the exterior and the rest of the interior. Together they form a clearly defined area that wraps around the driver like a capsule, producing a very sporty sensation. This creates a pure-of-purpose driving environment with a pronounced “cone of vision”, where the steering wheel as well as the surrounding black surfaces appear to be surging forward and, in so doing, accentuate the cabin’s powerful driver focus. The instrument cluster and central information display form a high-quality cluster of screens that are integrated into the driver’s cockpit to flawless ergonomic effect. The two displays are now positioned at almost the same height and in close proximity to one another, which gives the impression of a single, cohesive unit. They work together to deliver the right information at the right time. The driver can choose which elements they wish to call up (via touch command) from the content available in the information display – route guidance, playlists or other infotainment features. Above the instrument cluster, the Head-Up Display presents the key driving information within the driver’s direct field of view. Emerging from the driver’s side of the cabin is a sporty instrument panel of inherent lightness. The clever arrangement of surfaces and edging breaks up the considerable volumes and engenders the impression of a powerfully chiselled muscle. The clear wraparound design from the doors to the instrument panel enhances the sporty, cocooned feeling in both seats.